El Tamlált Talossán has undergone a dramatic shift in the past couple of months, adapting from a journal of opinion columns and collage cartoons, widely seen to strongly favor the FDA party according to recent polling, into a blog filled with informative short snippets of news. The architect of this transformation is new citizen Inxheneu Crova, who has become almost the sole contributor to the blog in June and July. Indeed, Crova has authored an astonishing 94% of all posts since he joined ETT, as of press time. Shifts in content and in contributors is completely normal in any organization, particularly one focused on Talossa. The pages of Beric'ht Talossan have often varied in depth and number of writers, ranging from twelve pages all the way to last issue's three, and incorporating the work of anywhere from two to ten writers. But these problems are particularly acute when it comes to a publication like ETT, which has an explicit editorial viewpoint but no particular schedule. Contributors with different points of view might feel unwelcome or might seek a publication that strives for diversity, and those contributors who do agree might not feel any particular pressure to submit their work on a regular basis. Further, many of the contributors to El Tamlált Talossán are part of the new Government, limiting their available time and the topics they are able to cover (no one in the Cabinet is likely to write an investigation of Government misdeeds, for example). 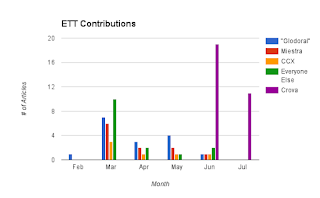 All of these challenges do a great deal to explain why ETT's strong start of 26 articles in March -- almost an article for every day of the month! -- experienced an immediate and sharp drop. 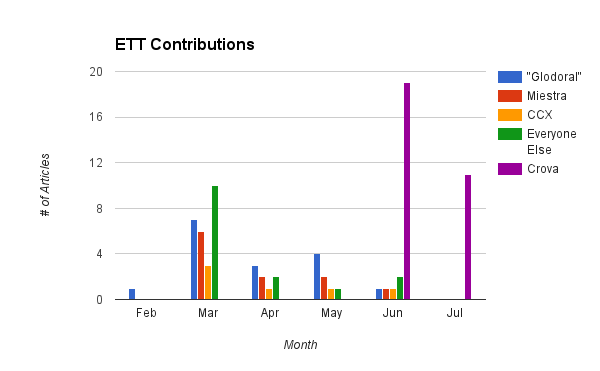 ETT contributions dropped by 72% for the next month, and didn't improve... until Crova joined the team. Almost single-handedly, Crova has brought new life back to the blog and returned it to the level of activity it held at its inception, writing every single one of July's articles. ETT's owner (and new Seneschal) C. Carlüs Xheraltescù is appreciative, calling him "incredible" and saying, "It's great to have him back in Talossa and working for ETT!" Crova is a former member of the Republic of Talossa, which he left as the prospect of Reunision approached. In his immigration thread for the Kingdom, he described being "burnt-out" at the time, and said, "I failed at the time to see the simple truth that Talossa is simply better together, as one nation." He was welcomed into the Kingdom with evident enthusiasm from all parties, and launched without delay into writing for ETT. Today, Crova is humble about his work, writing, "I hope [the site is] useful to citizens old and new, and especially for those citizens who are not on Wittenberg each day. I don't consider myself a good writer (in that my sentence stucture is appalling), but I am curious about how things Talossan work, and the ad hoc format of a blog suits the time I actually have on my hands to figure things out." While other contributors to the publication may begin writing and cartooning again soon, including award-winning cartoonist "Glodoral," for now everyone who enjoys ETT owes Crova -- the publication's rescuer these past months -- their solemn thanks.